Lighthearted summer musicals have become a staple with CATCO, and the troupe’s patrons seem to approve. They’ve bought so many tickets that both Evil Dead: The Musical (2011) and Avenue Q (2012) were extended and/or revived. This year’s offering, Forbidden Broadway’s Greatest Hits, Vol. 1, appears to be continuing that tradition. 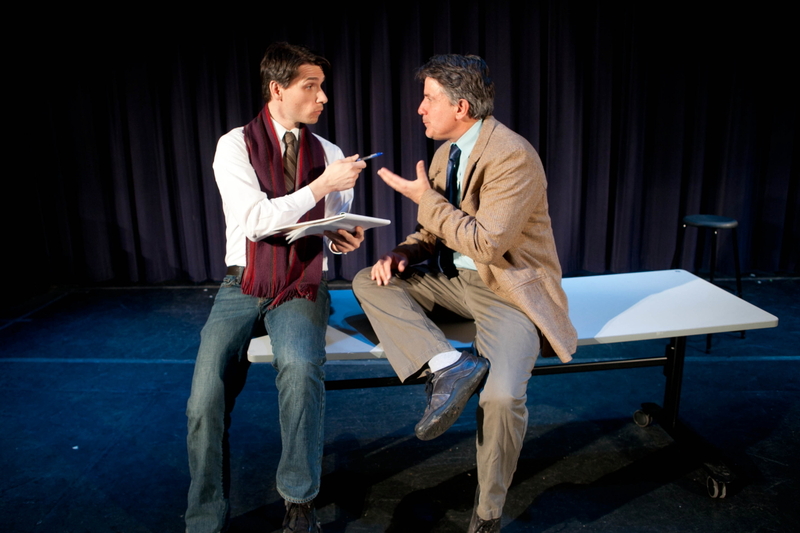 The satirical revue opened just last week, and it’s already been extended by four performances. It couldn’t have happened to a nicer cast—or one that’s harder-working. Joe Bishara (who also directs), Christopher Storer, Liz Wheeler and Dionysia Williams reveal impressive singing and improvisational skills as they storm their way through an evening filled with take-no-prisoners lyrics and blink-of-an-eye costume changes. Their purpose: to spoof a slew of well-known Broadway shows and stars. Created and written by Gerard Alessandrini, Forbidden Broadway has been updated numerous times since it opened off-Broadway in 1982. The latest New York version included takeoffs on current Broadway blockbuster The Book of Mormon and on Hugh Jackman, star of last year’s cinematic production of Les Miserables. Not surprisingly, the Greatest Hits show is less up to date. Some of its satirical targets, in fact, are more than a bit dusty. Williams does a nifty impersonation of Liza Minnelli in Liza One Note, for example, but when was the last time the star of the silver screen’s Cabaret has grabbed the spotlight? And the show’s version of America, featuring Wheeler as Chita Rivera and Williams as Rita Moreno, really tests the audience’s long-term memory—since it jokes about a presumed rivalry between the performers who played Anita in the Broadway and Hollywood versions, respectively, of West Side Story. Some of the targeted shows are equally ancient. Cats? Yes, it ran longer than any other Broadway show except The Phantom of the Opera, but the New York production used up the last of its nine lives 13 years ago. Still, even when the subject matter seems past its prime, the cast members are always admirable. And when their talent combines with one of Alessandrini’s particularly clever conceits, the results are sublime. Yes, Ethel Merman is long gone, but Wheeler brings her back in all of her full-throated glory in a piece that takes aim at modern singers’ tendency to let the amplification do the heavy lifting. Among the male impersonations, the funniest is Bishara’s take on “male chanteuse” Mandy Patinkin in an Over the Rainbow spoof that’s understatedly named Somewhat Overindulgent. Of course, satire wouldn’t be satire if it didn’t rub some people the wrong way. If you worship at the altar of Stephen Sondheim, you may be put off by a segment that rips into the composer/lyricist’s tendency to pack a whole lot of words and ideas into small amounts of time and melody. Even the audience gets into the act on this one, courtesy of a sing-along that eventually accelerates to breakneck speed. Adding to the show’s fun is the fact that it’s performed in an intimate cabaret setting on a tiny stage the performers share with music director and accomplished pianist Matt Clemens. The glitzy set, lighting and costumes—designed by Michael S. Brewer, Curtis “Nitz” Brown and Marcia Hain, respectively—are further pluses. Satire is said to be something that closes on Saturday night, but CATCO’s latest summer musical is proving to be an exception to the rule. 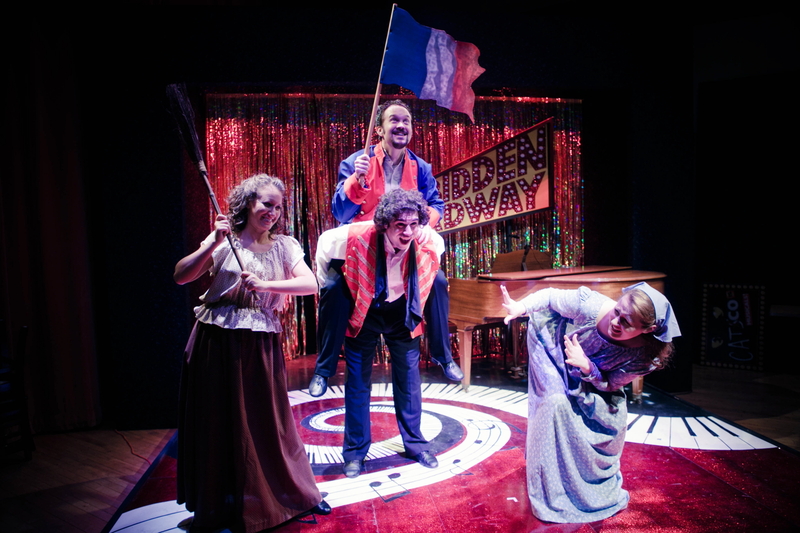 CATCO will present Forbidden Broadway’s Greatest Hits, Vol. 1 through July 14 in Studio Three, Riffe Center, 77 S. High St. Show times are 8 p.m. Thursday-Saturday (no show July 4) and 2 p.m. Sunday. Running time: 1 hour, 30 minutes (including intermission). Tickets are $35. 614-469-0939 or catco.org.